Professor Ford joined the University of California, Santa Barbara faculty of Chemistry after earning his Ph.D. with Professor Kenneth B. Wiberg at Yale U. and a postdoctoral fellowship with Professor Henry Taube at Stanford U. He has served as a Visiting Fellow at the Australian National U., Guest Professor at the U. Copenhagen , A v Humboldt -Stiftung US Senior Scientist at U. Regensburg and U. Muenster and Guest Investigator at the US National Cancer Institute. Dr. Ford was awarded the 1992 Richard C. Tolman Medal of the American Chemical Society, the 2008 Inter-American Photochemical Society Award in Photochemistry, the 2013 American Chemical Society National Award for Distinguished Service in the Advancement of Inorganic Chemistry, and is a Fellow of the American Association for the Advancement of Science. He recently was awarded the 2015 Royal Society of Chemistry (RSC) Inorganic Mechanisms Award for his fundamental contributions to the mechanisms of inorganic photochemistry, homogeneous catalysis and the bioinorganic chemistry of nitric oxide and related nitrogen oxide species. He has served as research advisor for >65 Ph.D. graduates and numerous B.S., M.S. and postdoctoral students at UC Santa Barbara. 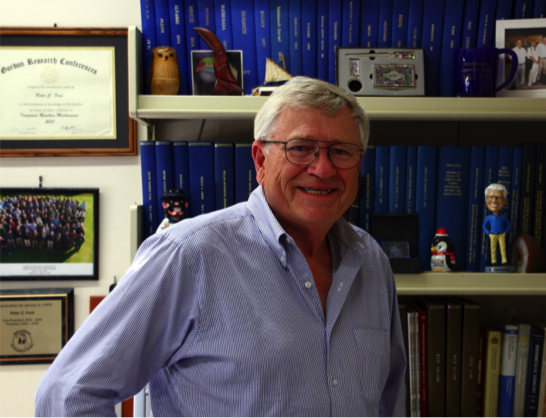 Professor Ford's research has encompassed topics related to the photochemistry, catalytic reactions and mechanisms of transition metal complexes. These interests are currently reflected in studies related to (i) quantitative reactions of coordinated nitrogen oxides relevant to mammalian biology, (ii) the photochemical delivery of small molecule bioregulatory molecules to physiological targets and (iii) the catalytic conversion of biomass feedstocks to chemicals and fuels. He has over 410 publications and 7 patents.